A large variety of hotels are available in Cartagena de Indias in order to satisfy all budgets and tastes. The Caribe hotel stays first in importance with the Hilton hotel close to the zone of Laguito. In the sector of Bocagrande, we find the hotel Capilla del Mar and Almirante hotel with forgetting the famous Decameron hotel with its full service. 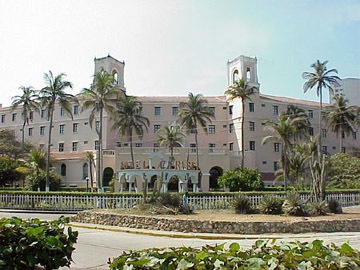 The Cartagena Plaza hotel is also an intersting option for those looking a good quality price lodging. On the other side of the airport on the beach of Blas el Teso, the Las Americas hotel represents a high luxury complex. In the historic center, the Santa Clara hotel as well as Charleston hotel are the most luxury. In the Getsemani district near the Conventions Center, th Monterrey hotel is ont with the best view in Cartagena. We present you some less popular hotel suggestions, but with more welcoming relations and a high quality in order to have more choices and more importantly, not have an imposed choice by those who only show the more expensive ones to get a bigger profit. The fees that we present you are amongst the lowest that you can obtain even by directly contacting the hotels, because we take no commission and we have no employees to increase our fees. Prices in pesos per day, per person, double occupation, standard double room, air conditioning. Our personalized visit and lodging plan brings you the mind peace that someone’s taking care of your lodging reservations and organization of your choice concerning the places to visit or entertainment to do.